Simon Bolivar's life makes for one of history's most dramatic canvases, a colossal narrative filled with adventure and disaster, victory and defeat. This is the story not just of an extraordinary man but of the liberation of a continent. Drawing on a wealth of primary documents, Marie Arana brilliantly captures early 19th-century South America and the explosive tensions that helped revolutionise the young Simon Bolivar. In 1813 he launched a campaign for the independence of Colombia and Venezuela, commencing a dazzling career that would take him across the rugged terrain of South America. From his battlefield victories to his ill-fated brief marriage and legendary love affairs, Bolivar emerges in this compelling biography as a man of many facets: fearless general, brilliant strategist, consummate diplomat, passionate abolitionist and gifted writer. A major work of history, Arana colourfully portrays this dramatic life and explores the rivalries and turmoil that bedevilled Bolivar's tragic last days. 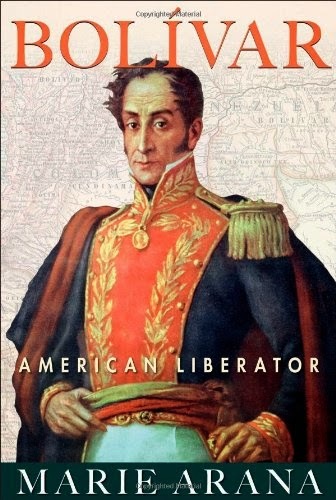 Did you know that Simón Bolívar, the liberator of what are now 6 different Latin American countries, at one point ruled more territory than Alexander the Great or Napoleon? I didn't, and I'm Latin American. It's quite an indictment of the Uruguayan history curriculum. In spite of spending months and months in school covering the revolutionary wars, it was almost exclusively the wars that resulted in Uruguayan independence that my teachers were concerned about. I had only a very shallow knowledge of Bolívar, and considering what an incredible, exciting life he had, that's a crying shame. Arana's follows the traditional structure of starting with Bolívar's immediate family history, his birth, and then moving forward chronologically. Through her narration, Bolívar really comes alive, and dominates the story, just as he dominated the politics of the time. Although I must say, when his late mistress, Manuela Sáenz, appears, she's even more larger-than-life than him! She was a revolutionary in her own right, as committed to the cause as Bolívar was, and the one of th emost fascinating, complex characters I've ever encountered. I particularly enjoyed the beginning of the book, in which Arana does a bit of a mise en scène for the rest of her story, describing what the life of a patrician Venezuelan criollo was like in the late 18th/early 19th centuries and giving some background of Spanish colonial policy and history. That felt like revisiting a place I hadn't been to since childhood, and that's exactly what it was. For all that we didn't cover Bolívar's revolutions practically at all in school (or, even more shockingly, the Argentinian San Martín's), there were a lot of features there that were the same or similar in the colonial Banda Oriental (what what's now Uruguay used to be called). History classes covering that period created a certain world in my mind, and I haven't been back there. For the last couple of decades, all I've read in Spanish has been literary fiction. The historical novels I read are in English, and South America is a part of the world that is largely ignored by them. Too bad, because the time of the Revolutionary Wars would make for a really interesting setting, and there's so much scope for stories to be told there. I could see, for instance, Carla Kelly writing a fascinating story featuring one of the thousands of British soldiers who decided to join Bolívar's army after being decommissioned when the Napoleonic Wars ended! The book does, however, get a bit bogged down when describing the one battle after the other of the Revolution proper. It's not too bad, but I'm sure there would have been ways to do it in a more interesting way. Also, there were what felt like disconcerting gaps, where the narrative just broke down. For instance, we'd be at a point where Bolívar is struggling for funds to keep his army going, and a few paragraphs later he'd be recruiting new soldiers and preparing a campaign, with nothing telling us how we got from one point to the other. There were a few too many moments like that, when I'd just go "What? How?". To be honest, after a while I sort of gave up trying to understand the detailed ins and outs of the different campaigns and concentrated on the more global aspects, and that worked much better. This is, after all, not a history of the Revolutionary Wars, but a book about Bolívar, and in that it suceeds perfectly. The other thing I wasn't crazy about is that, for a very recent book, this can at times have somewhat old-fashioned sensibilities. It's things like Bolívar's father's penchant for sexually harassing the women of the house being written in a mildly amused tone, which I found disconcerting. Also, at certain points the way racial issues were described made me uncomfortable, such as the derisive terms in which the campaigns of Boves and his "pardo" (mixed-race) llaneros where described. I get that Arana might have been trying to describe these in the way they would have been seen by people of Bolívar's time, but it didn't quite work for me. These issues are not pervasive or even frequent during the book, but they were certainly enough for me to notice them at times, so definitely worth a mention. At the end of the book, Arana has a section that's not purely biographical, more her thoughts on Bolívar's influence on the continent and the region, not least on Hugo Chávez and his "Bolivarian revolution". That felt like a good way to end it. On the whole, I enjoyed listening to this one, and it has sparked my interest in the people and the times. I'm definitely going to be seeking out a biography of Manuela Sáenz! MY GRADE: This was a B.
AUDIOBOOK NOTES: I listened to this version, narrated by David Crommett. He's not the best narrator ever in terms of the dynamics and the storytelling, but he was all right enough. What made me really happy was that he pronounced the Spanish perfectly, and that he did so the Latin American way (i.e. not pronouncing the c and z as "th", as they do in Castilian Spanish).